Swam for Team Jack, Grams and Hayes this morning! Proud to be a Croc supporting Massey Cancer Center!! Great work, Crocs, for a great cause! Donation made in honor of our warrior Jack Becker!!! Go Team Jack!!! Awesome Job Kaleigh and Meghan!! Wishing you the best of luck and keep up the good work! 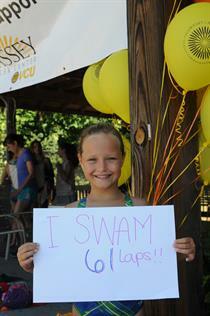 The Bremer kids are proud to be swimming to support Team Massey! In memory of Dave Boynton, Kaleigh and Meghan McPhail's grandfather. In honor of Jennifer Sullivan, family friend. Good luck to all the swimmers and especially the Lombardi kids! Pop would be proud and we love you!! From proud grandparents in honor of Leo, Nora, and Sam Lombardi and in memory of our dear friend Ellis "Pop" Lombardi and all those who have suffered cancer. In memory of Pop, and in honor of Jack and all of the fighters!